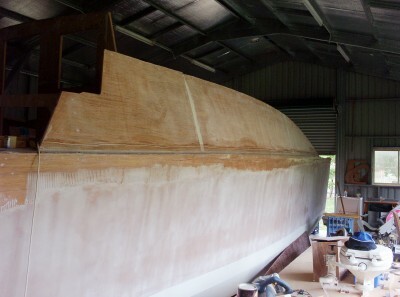 One cabin side is glued in place, the other is just about ready to glue. 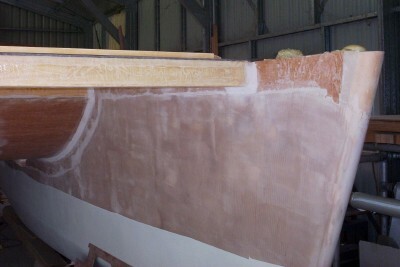 The forebeam is laminated from several pieces of timber. It's all glued and bolted in place. The foam coming out of the bows is overflow from the pouring foam that fills in the area forward of frame 1. I've made provision for anchor cleats forward of frame 1, by glueing some 50 by 10 aluminium bar underneath strengthening. When the deck's in place, holes can be drilled and tapped for securing the anchor cleats. This pic shows the lockers and storage in the "D" at the front. There are 3 deck lockers, and each cabin also has a storage area.. 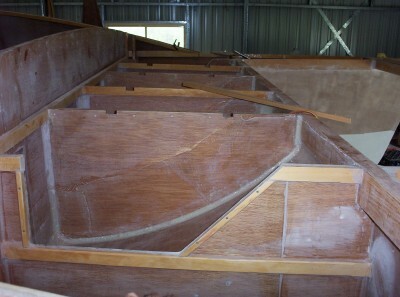 The pic shows the cutout from gunwhale to top stringer that gives access to these storage areas. Gone are the days of the manual toilet going straight into our waterways. 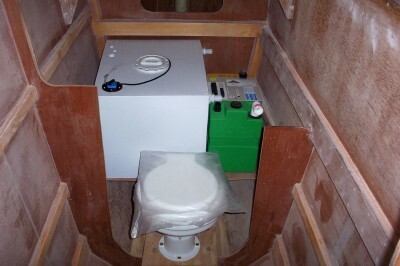 This pic shows the the electric toilet, Sani-Loo class C treatment system and Atlas blackwater holding tank. The only pump is the electric toilet, as the holding tank will be above water level. I hope it all works OK. They're not permanently installed yet - just put in position to make sure will all fit OK.